A few notes about the collage I’m making for this story. I created a background by covering foam core with blue cellophane. 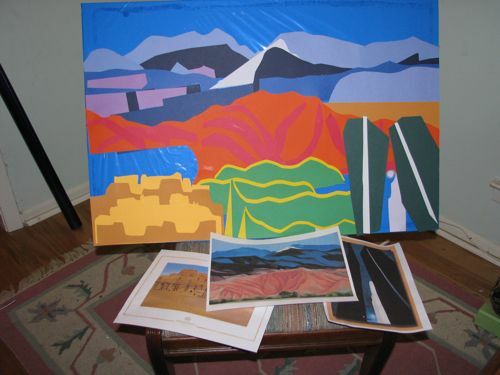 Then, I chose three settings–a desert pueblo, mountains, and a city skyline. Using O’Keeffe paintings as models, I cut blocks of cardstock into landscapes. This is the background for the photos I’m using to represent my characters and their lives. Hi Elisabeth, wanted to let you know I checked into the site. Great going! Thanks for telling us about it. Thanks for checking the blog out, Robin! That’s very pretty! Thanks for sharing it.